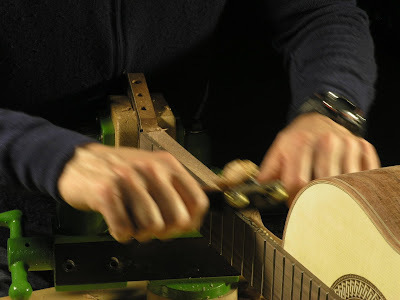 The Final carving of the neck began by trimming the sides flush to the fingerboard, first with a spokeshave on the main part of the neck, then with a chisel at then ends where the spokeshave couldn't reach. 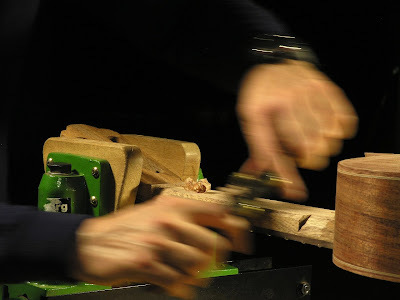 The neck thickness was then pared down to 21mm at the nut end, the final thickness. 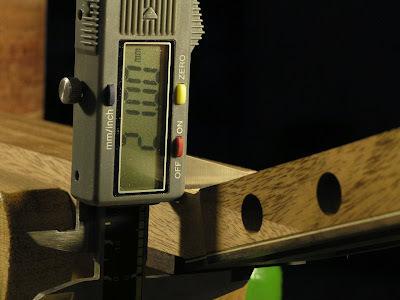 The thickness at the 9th fret was already the correct thickness, 23.5mm. 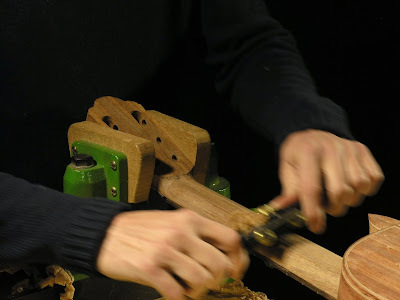 A block plane was used to taper the neck from the nut end to the heel. This worked rather well and ensured the back of the neck ended up straight. 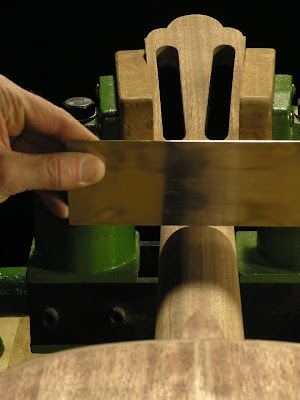 Next, bevels were cut on each side of the head and the heel. 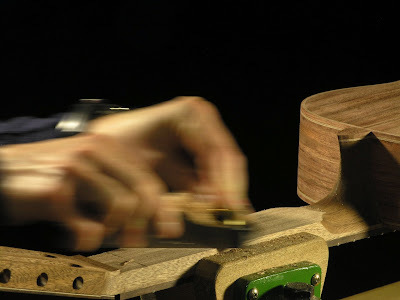 The idea here was to shave bevels along the neck on each side of the neck with the spokeshave, first with primary bevels, then secondary bevels, slowly letting the curvature of the back of the neck evolve in a controlled manner. I really like working with facets, but despite all the good intentions, it didn't really turn out the way I had hope for, either because of a rushed job or my lack of ability. 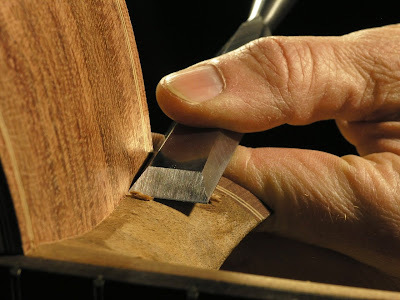 As the primary bevels slowly emerged, it became clear that a gouge in the middle of one of them had evolved, a gouge I was only able to get rid of by a hair by thinning the neck altogether by 0.5mm. It was a close shave so to speak. 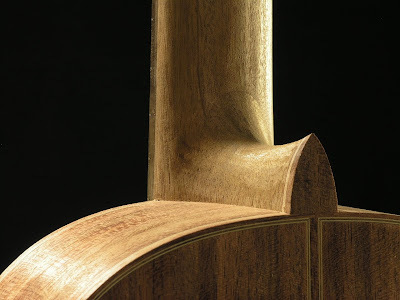 As the work proceded I resolved to carve the profile as one smooth curve, using a straightedge and light to check the straightness and even curvature of the profile, and using my hands to feel for lumps and indentation. It seemed to work fine. Cumpiano suggests that eventually this process becomes a quite organic one and after having been through it, I can see why. However, I still believe that working with facet will ensure more consistent work, even though it clearly wasn't the case this time around. Once the profile was getting close to finished, I slowly started to work it into the heel aiming for a seamless transition between the two. The same was done at the head however these curves had to be cut from scratch. 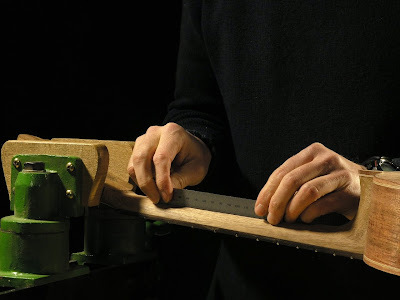 I marked a curve on the back of the head with a set of protractors, by placing one of the legs at the top of the head while scratching a circular curve exactly where the two members of the scarf joint met. 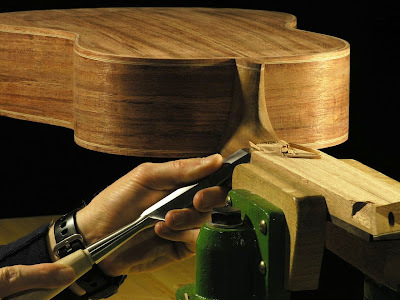 This circle segment was used as a guide to carve the transition from the flat head to the neck profile. Though this was not planned, it ended up disguising the scarf joint almost completely. 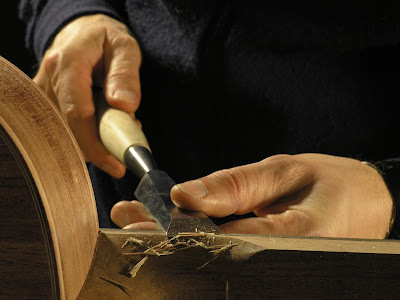 The carving was done with a paring chisel and finished up with a scraper. Then came the final carving of the heel. 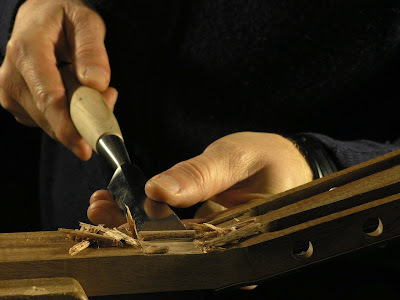 Again the paring chisel was tool of choice. 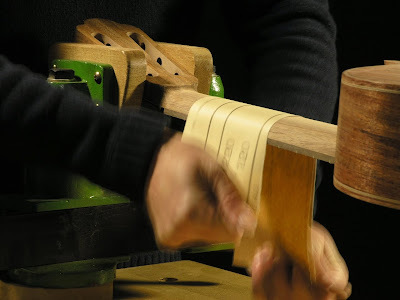 Not much had to be done to get it into shape as the existing heel was already very close to final shape. 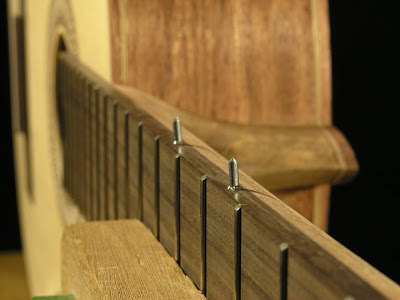 But, bits and pieces had to come off, particularly at the fingerboard joint and the area up against to the body, where glue was still present from when the sides were attached. (I'll never glue the sides on again). 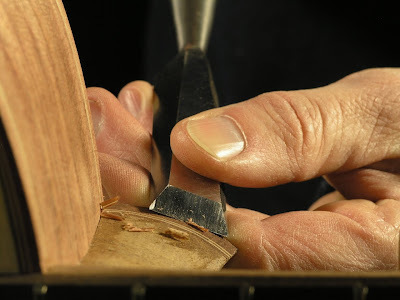 The area around the heel cap was also pared down to a smaller size. 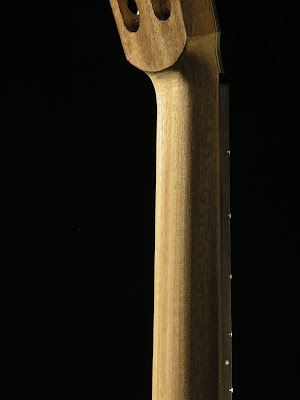 To finish the neck shaft off, sandpaper was used to even out the little bumps and hollows left over from the edge tools. First 120 grit garnet paper was used, then 220 grit. 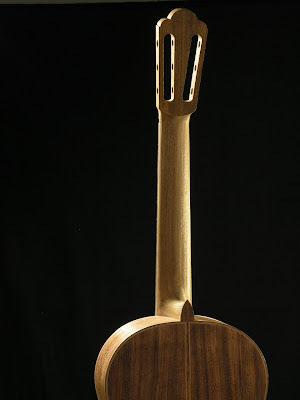 Convention in classical guitar making dictates that no marker dots should be added. 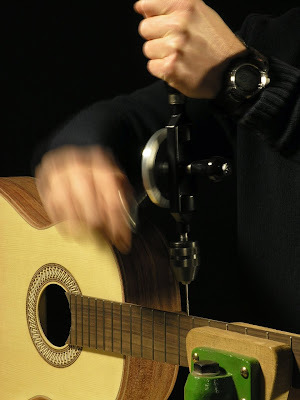 Purist will argue that one should be able find ones way around the fingerboard without these aids and adding them indicates the owner of the guitar is not a very good player. That may very well be the case, but nevertheless I decided to venture against convention, be daringly outrageous and added not just one, but two dots, one for the 5th and one for the 7th fret. I even considered a third dot for the 10th, but I didn't like the way it looked. So there you have it: I'm a dilettante and a terribly vain one at that. For the markers I used 13-gauge galvanized wire from the local hardware store. The diameter fits a 5/64" drill bit very well. The wire came in a 100 feet roll. I doubt I'll ever run out! 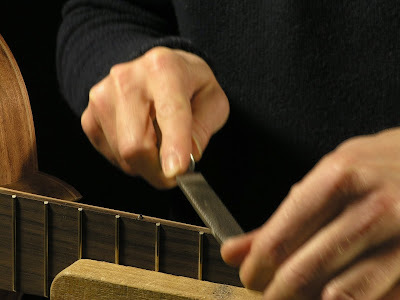 It was easy to cut and it matched the silver look of the frets very well. 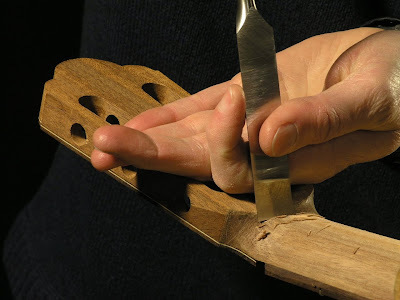 The placement of the dots was marked on the side of the fingerboard with an awl. 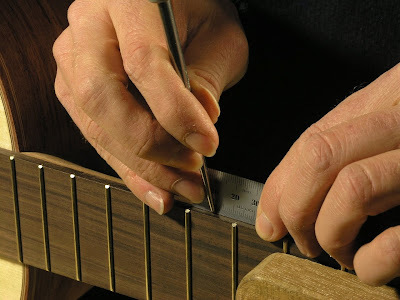 The halfway mark between the frets was measured with a small ruler, whereas I eyeballed the middle across the thickness of the fingerboard. 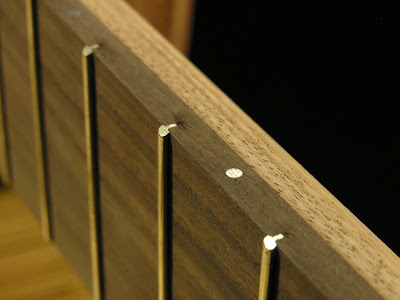 The holes were drilled with a small 5/64" brad point drill bit and a hand drill. I only have a big electrical hammerdrill and I thought it might be a bit of an overkill for the puny bit. 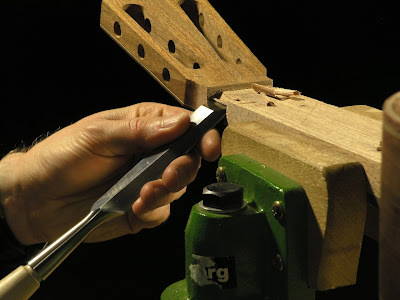 I did consider using a Dremmel tool but I didn't feel comfortable with it not having a proper trigger. 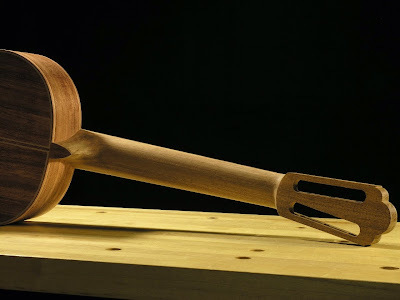 So in the end the hand tool won out. Last, the wire was cut into two small segments, each about 1/4" long. As the wire cutters flattened the wire a little, I had to grind the end a little with a file in order to make them fit the holes properly. 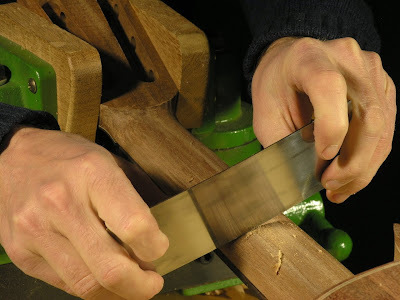 The segments was glued in with epoxy and once the glued had dried the protruding wire was cut down with wire cutters, then ground flush using a smooth file and finished off with sandpaper.